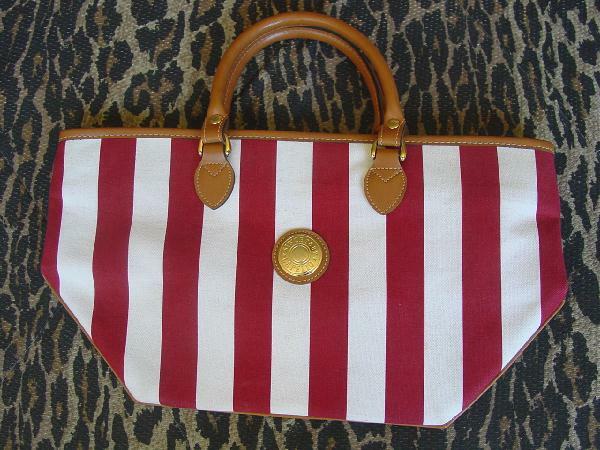 This vintage purse has a red and white vertical fabric exterior with caramel color faux leather two 13" long handles and trim. The gold-tone ornament on the front has etched letters that say * Since 1887 * Capezio. 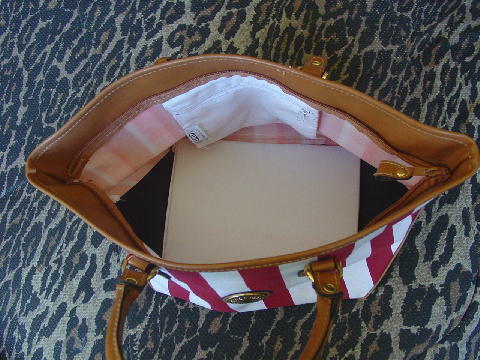 The interior has a white fabric zippered pocket which has yellow age marks on the bottom and back. The bottom has a black coating and a white fabric covered stiff (probably hard plastic) 6 7/8" by 9" insert. There is a coating on the interior (backside) of the exterior fabric. It has a top side to side zipper which is 2" downward from the top. There's a little age yellowing on some of the white stripes. It's from a stylist's inventory, and was used in several swimsuit photo shoots.